Mixed Fruit tart recipe: Of all tarts and pies, fruit tart is our family favorite. We love the custard filling topped with tasty fruits. Wonderful texture combination works well in this tart. The base of the tart is crunchy the inside filling is gooey and gives a cool experience when it enter in your mouth. With fruits really a party on the mouth. We just enjoy thoroughly when ever i make this tart. Now all the fruits are in season so i thought of making it and we enjoyed each and every bit. 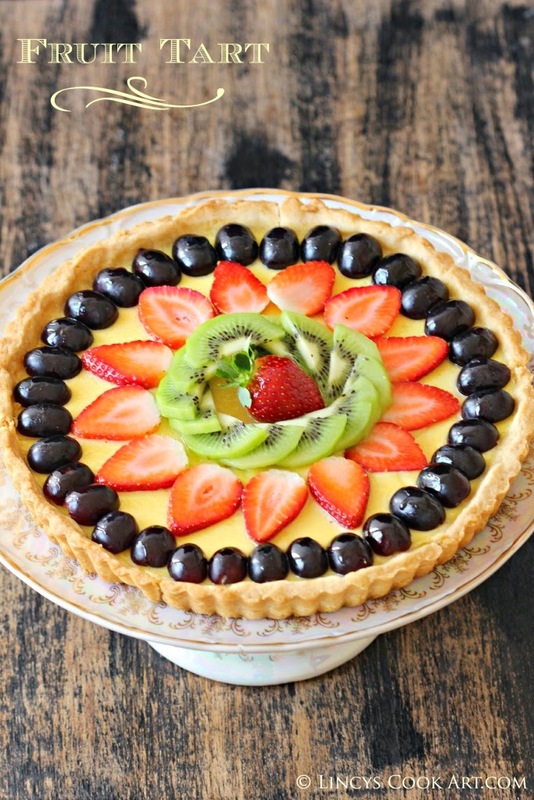 Easy to make tart with limited ingredients with the custard filling with the fruits of your choice or seasonal fruits. Perfect for parties as it can be made prior a day before too and chilled in refrigerator. Cut the chill butter in to small cubes. In a blender jar combine All purpose Flour, butter, powdered sugar, salt and 1 tablespoon of ice water. Pulse the ingredients until just combined like a wet sand appearance. If it looks dry add some more cold water and pulse again just to combine. Make this dough in to a disc or ball shape and cover with a cling film and chill for 30 minutes to harden. Take the pastry from fridge and roll it as a thin sheet on a lightly floured surface (or) inbetween two cling film using a rolling pin. Remove the cling film from one side and invert the dough and line the tart tin (23cm-25cm) and remove the cling film on top of the dough. Trim off the excess hanging edges by pressing the edges of the tart tin. Chill this pastry with tin inside fridge for 30 minutes. Pre heat the oven to 180 degree for 15 minutes. Place the tart tin on a baking tray and bake for about 15-20 minutes. Take out the tart tin from oven and remove the wax paper and the beans and bake for another 5-7 minutes to finish cooking the base. Leave it for 10 minutes and allow the pastry case to cool down. Reduce the oven temperature to 160 degrees and at the mean time prepare the filling. In a big bowl add the eggs, sugar and corn flour beat well using a hand whisk. Then add in the cream, milk and vanilla essence; stain the mixture to remove any lumps and set aside. Peel and cut the fruits and refrigerate till you use. After cooling a gap forms in between the tart case and the tin. Insert a knife between the gap and slightly lift the base and remove from the tin carefully. Bake at 160 degrees for about 30 minutes (or) the centre of the custard has a jiggle and the edges almost set. Remove the tart from the oven allow to cool till room temperature and cover the top of the custard with fruits of your choice. Melt the jam or use corn syrup and brush over the fruits. Refrigerate the tart before serving atleast 30 minutes. Slice the tart and serve chilled.